The importance of compliance with fire regulations musn't be underestimated. However, fire safety requirements across industries and sectors can vary considerably and understanding fire safety regulations can get pretty complicated. With this in mind, we've put together a brief summary of fire regulations in three key areas: education, healthcare and business premises. Fire Safety in Schools - What Makes an Effective Procedure? Fire safety in schools is essential as there are a lot of pupils gathered in one place, and this, combined with the fact that school science laboratories often contain highly flammable and dangerous substances mean that an uncontrolled fire could quickly spread. Fire safety is of the utmost importance in any building but particularly in the workplace environment when there may be several hundreds of employees for which you are responsible. The law recognises the importance of fire safety in non-domestic premises. Any employer, landlord or owner who fails to abide by fire safety regulations is at risk of a heavy fine or even imprisonment. Chosen carefully, fire suppression technology has the potential to provide an effective means of minimising the amount of damage caused by a fire outbreak within a building. Operating in tandem with fire detection systems, they are capable of controlling and even extinguishing fires without the need for any human intervention. Engineered to control the length and intensity of fire outbreaks, suppression technology operates by responding to fire emergencies so that to the extent to which the fire escalates is limited. Some examples of automated suppression technology include; fire sprinkler systems, gaseous fire suppression, and foam systems. While it is essential that fire protection technology of this type is only used in conjunction with other fire prevention measures, it can provide a vital 'first response' to fire emergencies. As any responsible business owner, manager, or site manager knows, putting an effective fire safety plan in place is an essential part of ensuring optimal safety for staff members, customers, and visitors. With that in mind, we've explored some of the major aspects of fire safety which make devising and implementing an effective plan so important, as well as highlighting some key elements which your plan should include. Taking adequate precautions to guard against fire is without doubt one of the most important safety concerns anyone with responsibility for a commercial or other non-residential building needs to address. Business people in particular must bear in mind that as few as one in three businesses are able to continue trading in the event of a serious fire, ceasing operations either during the immediate aftermath or within three years. As little as a decade ago, warehouses were seen as a quite separate entity within the overall supply chain. They were intended merely for storage of merchandise until it was transported to its final destination. In recent years, however, the business community has become aware of the true potential of a properly optimised, state of the art warehouse to both safeguard assets and improve efficiency. At Contact Fire & Security, we work closely with technology providers to deliver integrated warehouse solutions which go far beyond simply providing a convenient and secure storage facility. Used in conjunction with more established security equipment such as CCTV and alarm technology, the systems we install can be used to fully optimise warehouse security and enhance vital operational functions including stock management, workflow, and order fulfilment. 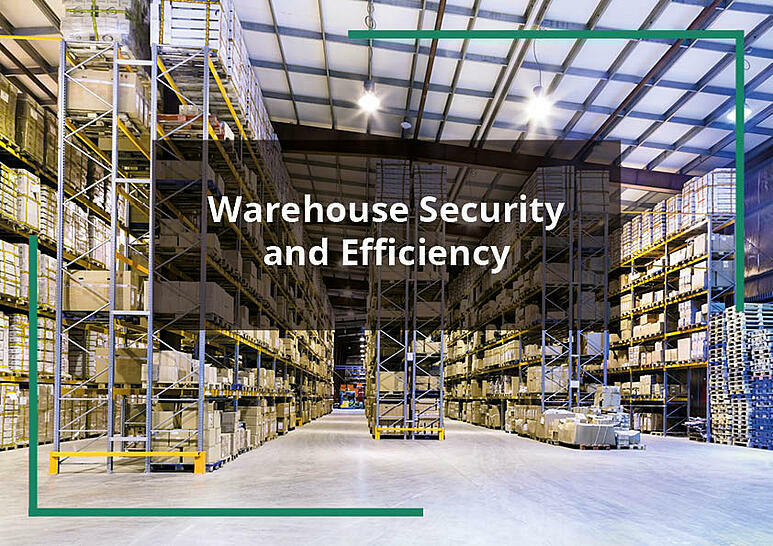 While what works most effectively will of course vary, we find that the following strategies for improving both security and efficiency will be beneficial in most warehouse settings. A recent study commissioned by the British Sprinkler Alliance (BSA) and conducted by the Centre for Economics and Business Research (Cebr) revealed that, much to the detriment of the UK economy, £1 billion and 5,000 jobs were lost due to warehouse fires in Britain over a five year period. In terms of your own business, government statistics suggest that the chances of continuing to trade after a such an event are slim, with around 75% of businesses which have suffered a warehouse fire ceasing operation either immediately afterwards or within three years. The case for installing fire alarms, therefore, couldn't be more clear-cut. Which fire alarm system you choose, however, depends on a number of factors such as the nature of the premises in question, how they are used, and any budget restrictions. One option to consider is whether to use standard or monitored fire alarms. Achieving optimum security for your business requires a methodical approach which addresses a number of key elements, both in terms of the characteristics of the building itself and the way in which your business operates. A successful security strategy will utilise a range of different technologies and techniques to create an integrated system which is able to respond and adapt to security issues and threats on an ongoing basis. While the specific warehouse security challenges your business faces will require a degree of prioritisation, during our many years in the industry we have identified a number of issues which have proved to be all but universal. In order to help you ensure that none of these are overlooked in your own warehouse security strategy, we've put together this straightforward, informative checklist. False alarms undermine the reliability of your warehouse fire and security system, and can lead to financial losses due to the cost of actioning an appropriate response and potential disruptions to productivity. Therefore, while false alarms will always remain a possibility, it is advisable to minimise instances of this type to the greatest possible extent. To assist you in implementing an effective false alarm prevention strategy, we have identified the following core concerns for you to consider while designing, updating or reviewing your own warehouse security system.